State-of-the-Art Treatment Options to Alleviate Even the Most Severe Chronic Pain. At New England Spine & Disc, pain is a thing of the past. Are you looking for a non-surgical treatment solution for your chronic pain? You've come to the right place! When you have pain, it simply cannot be ignored. Why add more discomfort by getting an epidural or having surgery when you don't have to? New England Spine & Disc utilizes high-tech treatment options to relieve you of the worst back, neck, knee, heel, joint and post-surgical pain. 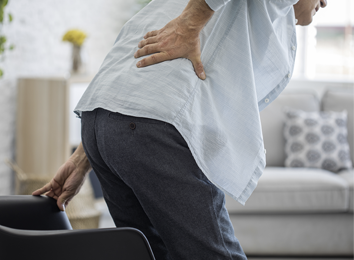 This FDA-cleared technology has been proven to help reverse disc herniation and relieve chronic back, neck and leg pain. It creates a vacuum effect on the disc, enabling it to pull in a fresh blood supply to promote healing and unload pressure on neurological, vascular and osseous components. As fluids are drawn back into the surrounding area of the damaged disc, nutrients, blood and healing substances help reconstitute the disc. Decompression treatments are very gentle. In fact, every once in a while we'll catch a patient sleeping during their treatment! A gentle beam of laser light is directed over the affected area to help the injured cells regenerate five times faster than they would on their own. Class IV laser therapy is used by leading health organizations, researchers, universities and sports teams throughout the world, including Harvard Medical School, NASA researchers and the US Navy. At New England Spine & Disc, we provide various decompression, shock wave and laser therapy treatment options to treat even the most severe chronic conditions. To learn more about the amazing technologies we treat our patients with, contact New England Spine & Disc today! Fill out the information below and someone from our staff will get in touch with you shortly! "When I first came in I had so much pain in both of my shoulders, left arm, neck, and jaw. The pain also radiated to my upper back and shoulder blades. I also had an unbelievable headache. It would wake me up at night. Now, almost at the end of my program, the pain has been reduced overall by 70%! I have had no drugs or surgery. I am glad I underwent the decompression and laser program! *"
The contents of this webpage are Copyright © 2019 New England Spine and Disc. All Rights Reserved.